• The cat flea (Ctenocephalides felis) is the most common domestic flea. 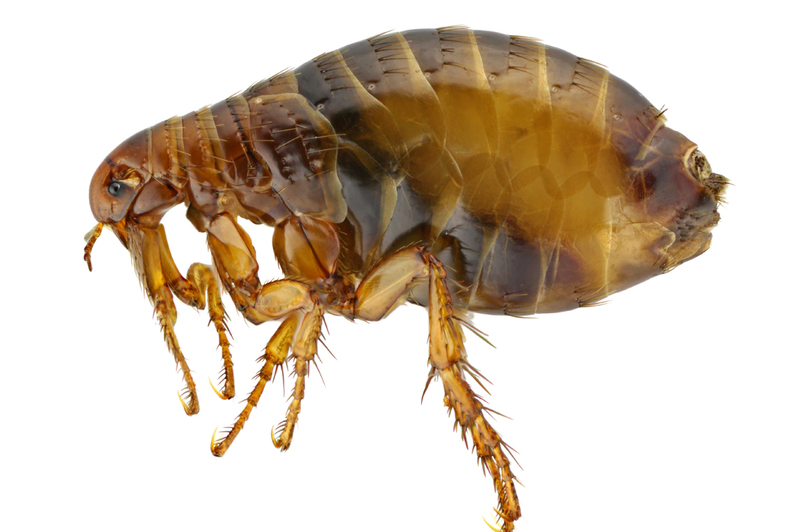 What does a Flea look like? • On a host body. Once a flea hatches and becomes an adult, it uses its powerful legs to jump onto a host, where it likely remains at all times. While attached, the flea will feed, mate and lay eggs. • The eggs often fall off of the host and can be found in the yard, bedding, carpeting or blankets. • When it comes to pets, fleas can also serve as an intermediate host for tapeworm. • Additionally, the saliva of fleas is known to cause serious allergy dermatitis in dogs and cats. How can I prevent a Flea infestation? • Maintain a clean home. Practicing basic good housekeeping skills is key to avoiding an infestation. • Vacuuming carpets, floors and furniture frequently, along with regularly washing of bed linens will help remove any existing fleas and help prevent the laying of new eggs. • Since fleas are often carried by rodents, it is important to eliminate any places that might entice rodents to build a nest. This can be done by keeping the lawn properly landscaped – mowing the lawn on a regular basis, replacing loose mortar and weather stripping around the basement foundation and windows, and removing all moisture sites around the property. • Check all pets regularly and thoroughly for fleas, especially after spending time outdoors. Be on the look out for excessive scratching and licking. • Bathe pets immediately after outdoor walks or playtime with other animals. • Wash all pet bedding, collars and plush toys frequently. • Speak to your veterinarian about flea prevention treatments. How do I get rid of Fleas? • Fleas reproduce quickly – a single flea can produce as many as 400 to 500 offspring in their lifetime. This makes controlling a flea infestation very difficult. • Your Vet can recommend the best methods and products for treating fleas on your pet. • Fleas in your home are best controlled and eliminated by a licensed pest control specialist. Please call DKS Pest Control at (724) 478-5344. The information contained in this website is for general information purposes only. The information is provided by DKS Pest Control and while we endeavour to keep the information up to date and correct, we make no representations or warranties of any kind, express or implied, about the completeness, accuracy, reliability, suitability or availability with respect to the website or the information, products, services, or related graphics contained on the website for any purpose. Any reliance you place on such information is therefore strictly at your own risk. Only a licensed and trained pest control specialist can properly identify a pest and determine an appropriate course of action. And that determination can only be made after a complete physical examination of the affected site has been made. In no event will DKS Pest Control be liable for any loss or damage including without limitation, indirect or consequential loss or damage, or any loss or damage whatsoever arising from the reference of information contained on or connected to with this website. Every effort is made to keep the website up and running smoothly. However, DKS Pest Control takes no responsibility for, and will not be liable for, the website being temporarily unavailable due to technical issues beyond our control.